Do you remember this story from Breaking Defense? By 2023, the Marine Corps wants prototypes for a radically new scout unit they want to be the ground version of the F-35 — scouting ahead into hostile territory, killing key targets, and feeding data back to the rest of the force. Though called the Armored Reconnaissance Vehicle, the project has evolved well beyond a straightforward replacement for the aging Light Armored Vehicle (LAV) into a networked family of manned vehicles, ground robots, and drones, collectively capable of not only reconnaissance but also electronic warfare and long-range precision strikes. Well guess what sports fans. This most ambitious Marine Corps armored project since the EFV has been all but canceled. Check this our via Shepard Media. Budget restraints and the possibility of a severely reduced fleet dampened the announcement of a long overdue future Armoured Reconnaissance Vehicle (ARV) programme for the US Marine Corps (USMC). An RfI for a future amphibious ARV will be released in February 2019 kicking off the programme to replace the current Light Armoured Vehicles (LAV) fleet. 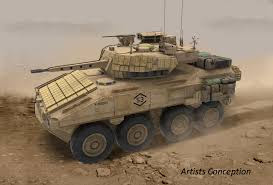 Yet, according to an official speaking at the International Armoured Vehicle conference in London, budget constraints mean that this might be too little too late. A current road map for the project puts IOC at 4QFY30 and FOC at 1QFY34 meaning the 35-year-old LRV family will have to stay relevant for another 17 years. The service indeed has a number of other priorities, such as fielding the JLTV and ACV increment 1.1, with funding at finite resource. The project may also be overshadowed by a fleet reduction of 150 from the current 650 platforms to just 500. The USMC will perform an analysis to determine whether 500 vehicles would meet battalion combat requirements. Ahead of the RfI the USMC has started putting together a list of requirements, although these too have been constrained by the budget. Predictably, water mobility remains the top priority with a focus on inland bodies of water such as rivers and lakes. The USMC also wants the new ARV to keep the transportability of the vehicle it will replace and allow for the transport of four vehicles by Landing Craft Air Cushion, but will permit a 25% weight increase. Other requirements are common to US DoD vehicle development programmes such as enhanced battle management systems, autonomous ability, unmanned and aerial ground systems and manned-unmanned teaming. I've been running this blog for a little while now and I can read the tea leaves. First the requirements are cut back, then an assessment is done, and then the decision is made that the current vehicle with modest upgrades will get the job done for the foreseeable future. To be honest when I first saw this I thought back to a concept that called for all Marine Corps armor to be air transportable. The big dawg in that concept was the LAV-A2 and this vehicle looked like a backdoor attempt to keep that alive. But I have to admit. That was gonna be one hell of a rig, and that the possibilities of it plugging into the Navy-Marine Corps "fires" network would have been beyond cool. It could have almost revolutionized ground recon. But budgets are budgets and the ARV is the first of what I fear will be many victims.